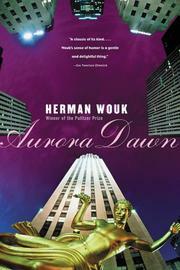 The title page reads "Aurora Dawn or, The True History of Andrew Reale. Containing a Faithful Account of the Great Riot. Together with the Complete Texts of Michael Wilde's Oration and Father Stanfield's Sermon." ... Well- there you have it. A deliberate attempt to set a modern story (satirizing radio advertising and advertising bunkum generally -- plus making an undercut at the use of religion to pull sales), to set such a story in Victorian frames of expanded title heads, and rambling inconsequential. Frankly, I found it forced, artificial, and would excuse it chiefly as a satire on the satires -- a little something that would have to be kept in the air like a shuttlecock or fall of its own weight. I confess that for this reader at least it fell, kerplunk. However, that's just my reaction to it. There are others- including its publishers- who have gone completely overboard about it. I like those publishers. I hate to disagree with them about one of their pets. (I do agree when they say that the book offers a problem of considerable dimensions.) Incidentally, if your customers ask whether it is like a certain other book on a like subject, you might say- "Points of resemblance. No dirt."